Chermoula is a key element of Moroccan cooking. It is incredibly useful to everything. I often make a larger batch and store in the refrigerator where it will stay for long. Great for example Salmon, potatoes. vegetables etc. Put everything in a blender and run until smooth. Keep cool. Oh this looks fantastic!!!! Can’t wait to try it out! Looks amazing! Loving anything with Tumeric right now. 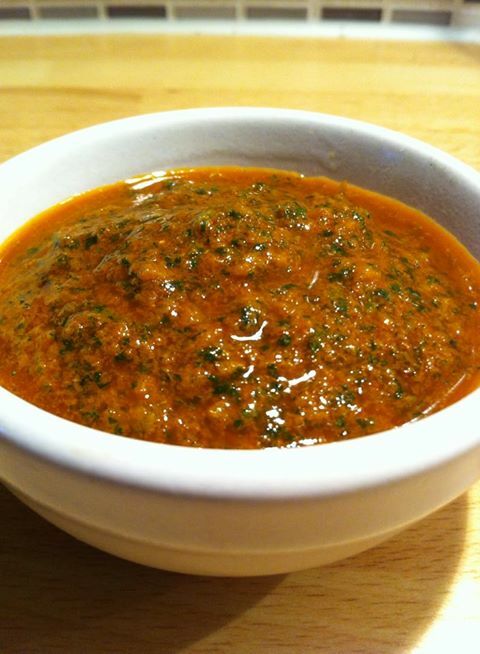 I absolutely adore chermoula. The flavors remind me of sunshine. aaah… easy peasy to make!!! I have indeed 😀 lots of bookmarking!! Thanks for sharing! Will be adding this to the must make list !! Sounds amazing. I love foods from all over the world and have been thinking of Moroccan food lately. Gonna have to try this. Oh great. Gonna hit that follow button now. Yes, the flavors look great!! Thanks a lot..I just made it…it tastes amazing…just stored it in the fridge…soon shall make a Moroccan stew with it.. I have a good friend who is Moroccan and I can’t wait to try this out on him. Also, as a vegetarian–I can’t wait to try it out on ME! Great! Let me know what you think and I’m sure your friend will like it.